This 6-week, 5 day/week training program provides short, intense, 30-45 minute training sessions for tactical athletes who have minimal training time. 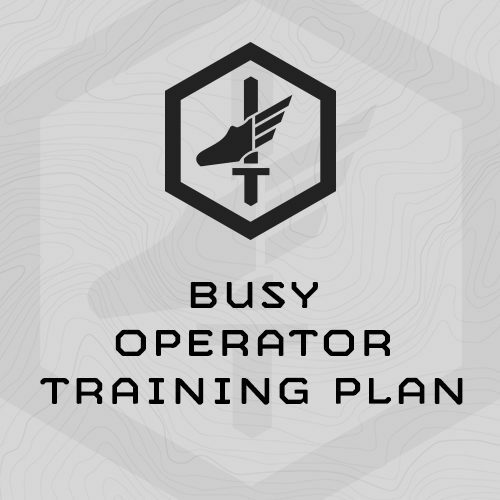 The program deploys MTI’s Fluid Periodization methodology to train strength, work capacity, chassis integrity and military endurance (running, rucking, loaded step ups) concurrently. This is Version 2 of this training plan, updated April, 2017. This program is specifically designed for military and other tactical athletes. Completion of the program requires a fully-equipped functional gym, complete with barbells, racks, and plyo boxes. In addition, you will need a 25# weight vest, or Individual Body Armor, plus a ruck for rucking and weighted pull ups, and boots/shoes for rucking. A stop watch with an interval timer will make working through the session easier. Timex Ironman is best. How long will sessions last? These training sessions are specifically designed to be completed in 30-45 minutes. Work briskly, but not frantically, through these training sessions. If you miss a day, make up the session you missed the next day and follow the programming as prescribed. Don’t skip ahead. Is carrying the 10# sledgehammer/dumbbell or rubber rifle necessary? Yes – it mimics rucking with a rifle, and is great grip strength training. These are prescribed in the training plan. For example, if the session calls for Power Cleans at 85/135#, the first load – 85# – is for women, and the second load – 135# – is for men. Click the “Sample Training” tab above to see the entire first week of programming. So, I'm using Busy Operator II. I thought, how much progress can I make with only 45-60 minutes per day. You have to spend hours to make any great strides. My first 5 mile test was 51:30. My second was 47:28. My third, this morning, was 45:00. I may be back down to a sub 40, 5 mile if I'm not careful. Thanks for your great programs. If you work them, they'll work for you. And I'm losing weight.